Countless enthusiasts struggle to balance their passion for customs with the obligations of normal life. Projects can be costly, time-consuming, stressful and sometimes a giant pain in the @ss. However, many are able to strike harmony in this tension, integrating their love for customs with home-life and sharing their passion with their loved ones. Very few, however, have found the remarkable rhythm that Rick and Tempie Abate have found in their mutual love for customs. 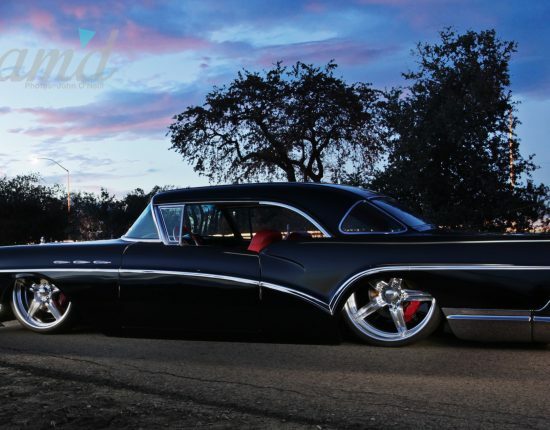 The dynamic husband and wife duo have spent the last fifteen years of their life in Orange, California building classic after classic – together. Their general arrangement has left the exterior and mechanics to Rick and placed the color scheme and interior in Tempie’s capable hands. 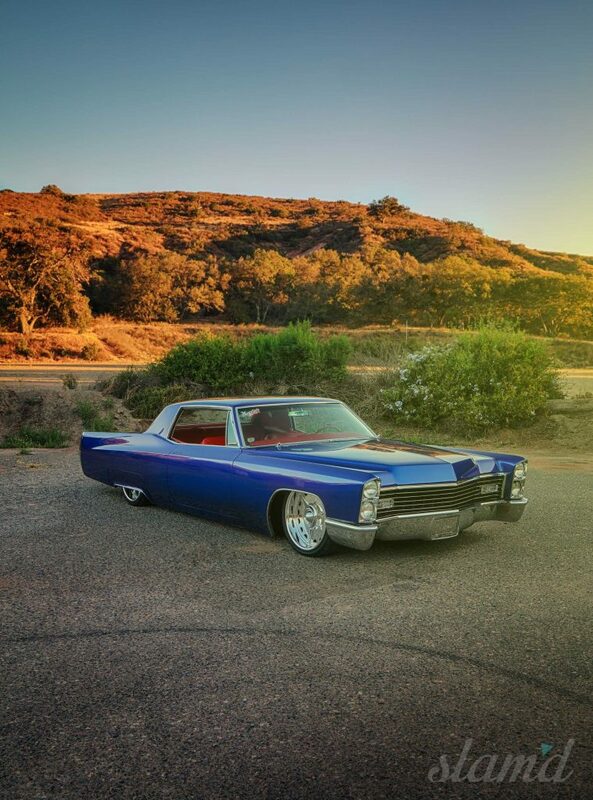 With a history that includes multiple Impalas, classic Fords, two corvettes, and 12 Cadillacs, the Abates’ system seems to be working out quite well. 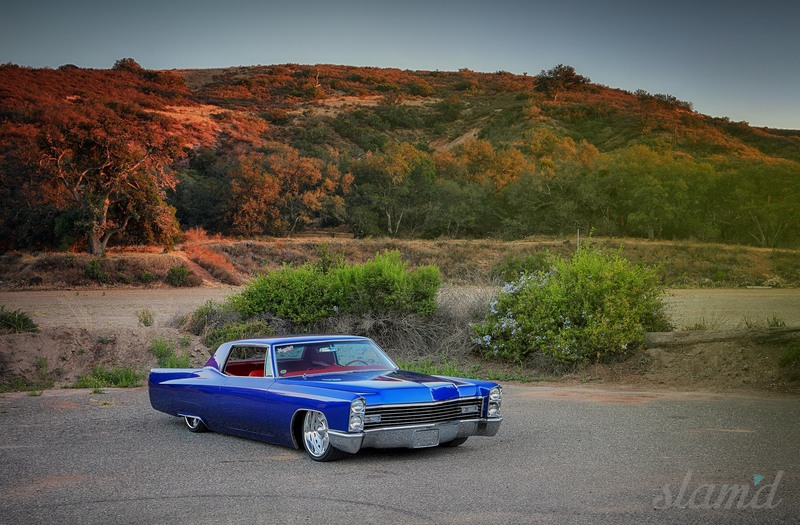 For their most recent endeavor together, Tempie and Rick answered the call to build a SEMA 2016 Show vehicle. 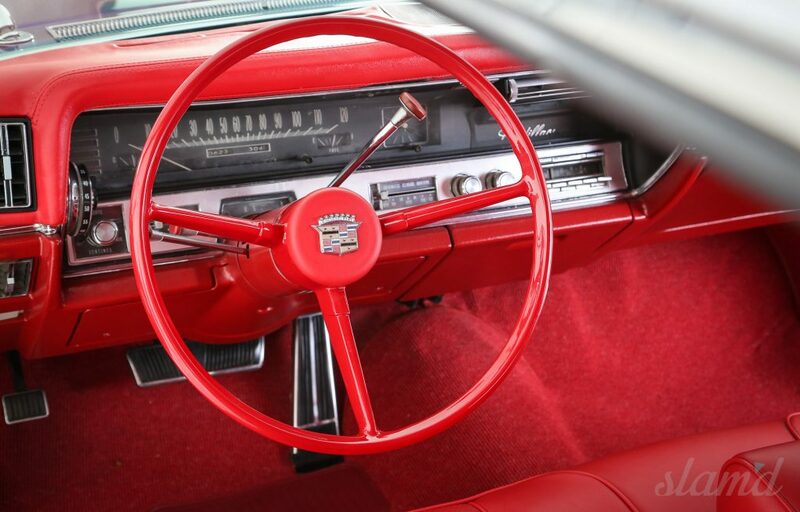 Having had fallen deeply in love with classic Cadillacs, the couple set their sights on a 1967 Coupe De Ville. Their crowning jewel would be a showcase of multiple top-tier sponsors for SEMA and as such had to be their most extensive build and all of this was accomplished in just 18 weeks. 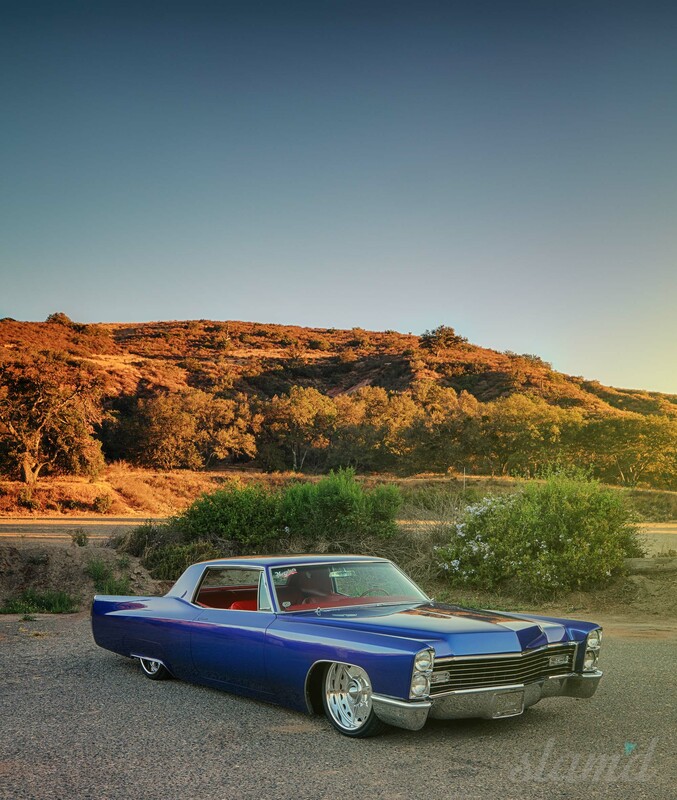 With an extensive “road trip” of customization ahead of them, the Abate’s first contacted Matt Bernal to produce a rendering and design plan for their Caddy. With this in place, the couple dove head first into the work. They began with stripping down the coupe to the bare metal, knowing that their first objective would be completing the major fabrication work. The frame was cleaned, smoothed, and prepped for finish work. This included removing the original bump stops, body pads, and relocation all of the shock mounting points. Next was establishing the configuration for the front and rear suspension. 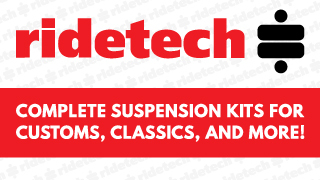 Both use a combination of the factory original set-up and modern aftermarket parts. Factory control and trailing arms work in conjunction with Air Lift Dominator bags at each corner and CPP Nitro 4-valve shocks in the rear. The clean suspension allows Sinister to crouch low over its radical wheels. The American Racing wheels are signature Max Grundy designed Stellas. 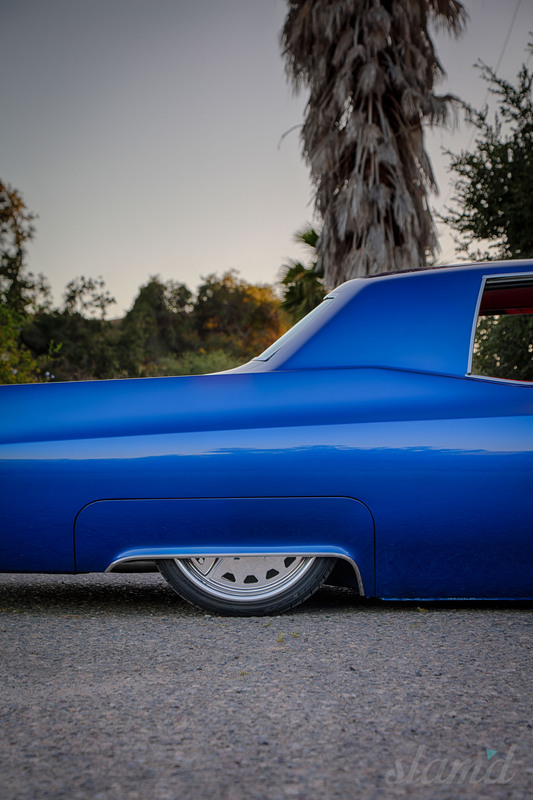 Rick and Tempie opted for a squared stance, with both the front and rear wheels measuring 20×8.5-inches. Each wheel is paired expertly with Nitto premium rubber, 235/40/20. The stop system here utilizes CPP’s big brake calipers with cross-cut, drilled, and ventilated rotors. 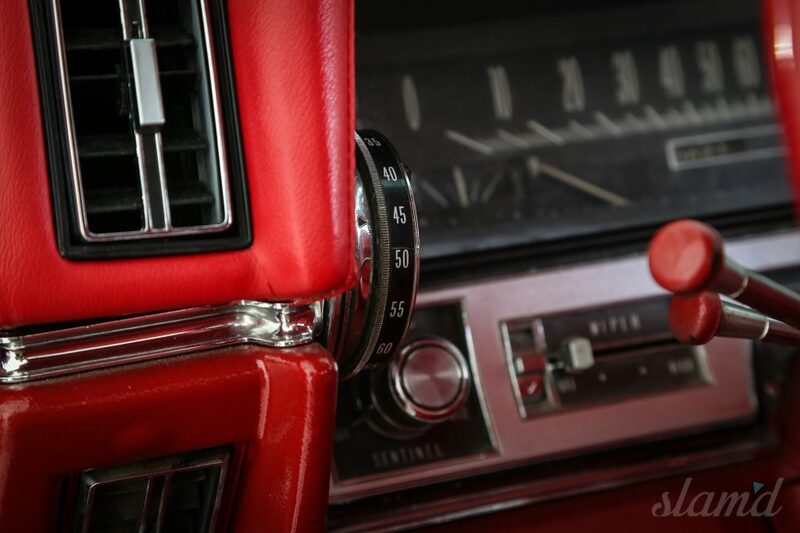 Sending power to the rear wheels is an intricately restored, all original Cadillac 429 V8. 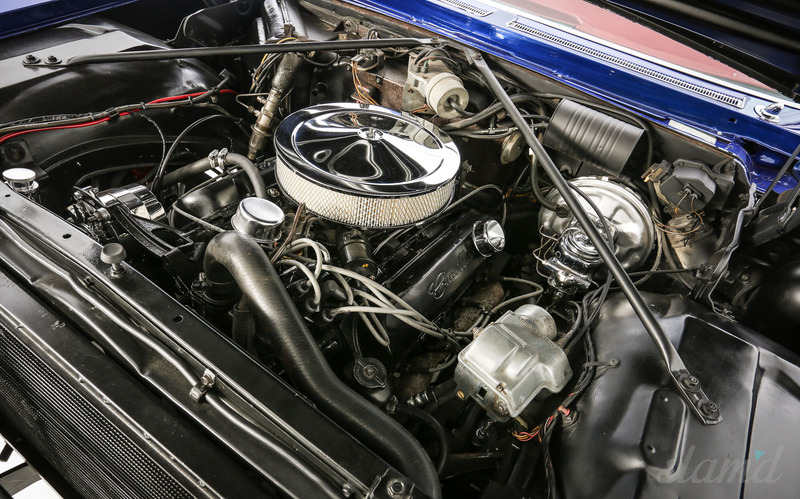 With a displacement of just over 7-liters, the classic engineered SOHC motor makes 340hp and sends its 480 lb. ft. of torque singing through the rest of the drivetrain to the 12-bolt rearend by way of a 200 R4 overdrive transmission. The original exhaust was replaced with a custom stainless steel system. The exhaust now measures 2.5-inches in diameter, allowing it to breathe heavily through the dual Flowmaster 44 mufflers. While laying the foundation and the revival of the factory goods, Tempie shifted her focus to the finish design elements of Sinister. 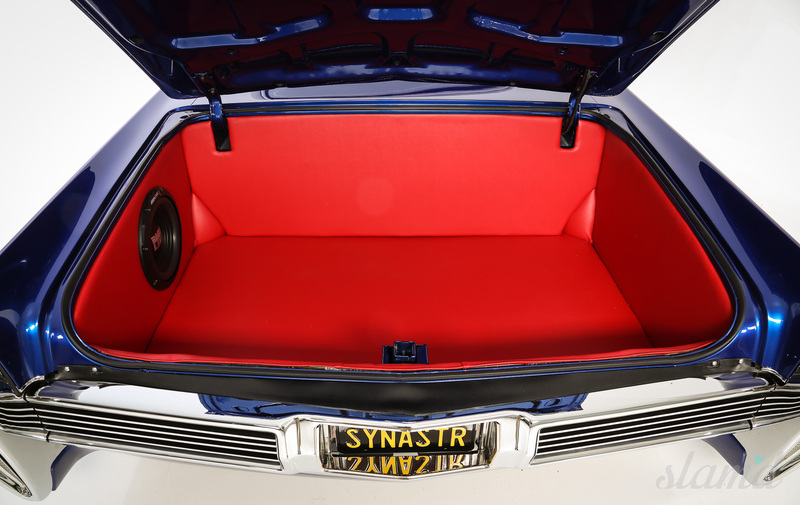 She worked directly with Paul Still of PPG paints to develop a one-off exterior color. 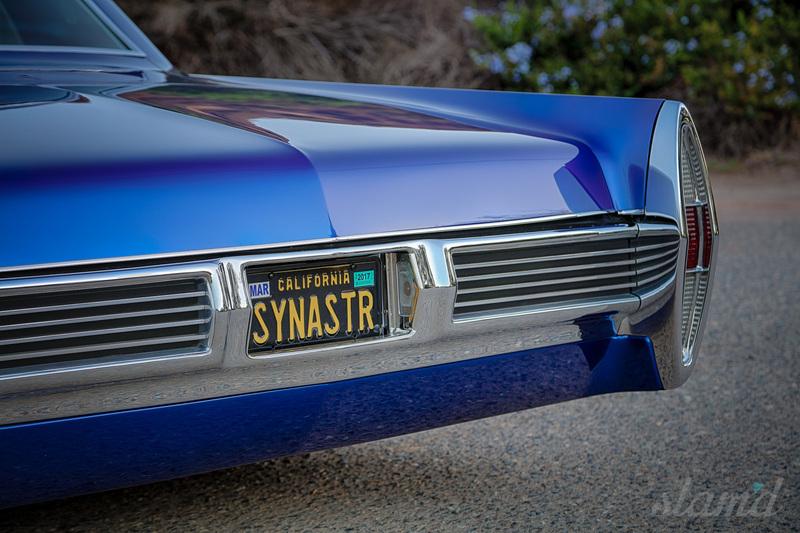 The end result is the unique, “Sinister Blue” named for its subject. Before the special coating could be applied, the build’s most labor intensive process began. 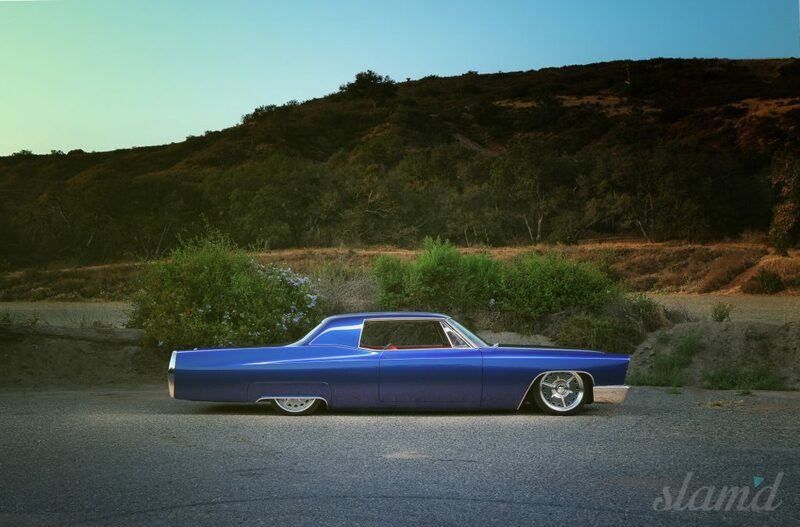 The Caddy’s body was slimmed down to its sheet metal and completely smoothed. 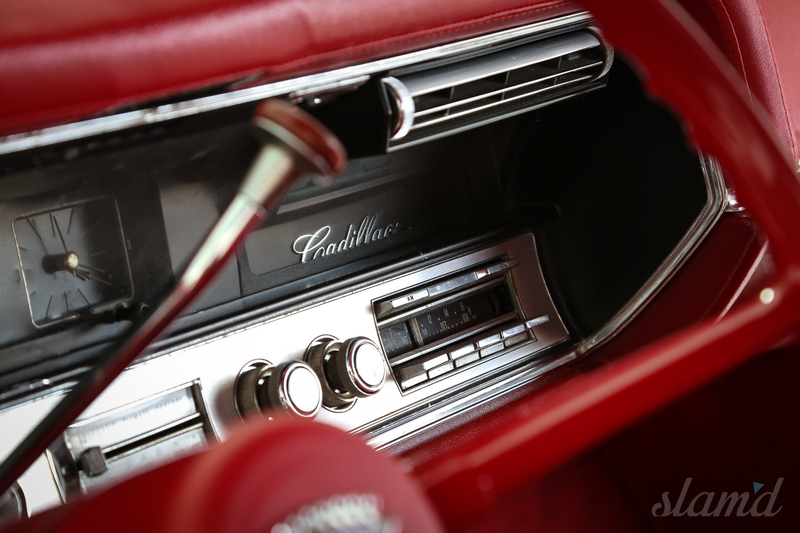 The process included shaving all exterior features such as the door handles, keyholes, gas door, and even smoothed the door jams. 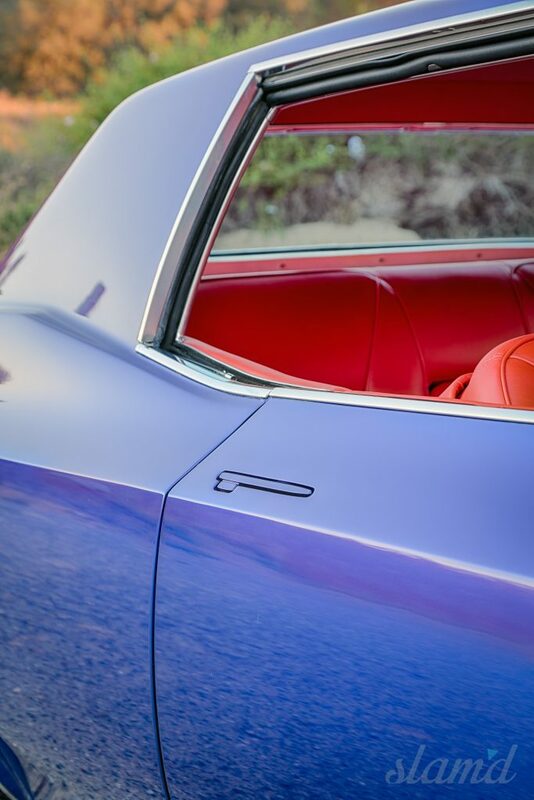 For a sleek and modern feature, Kindigit’s body-flush door handles were installed. 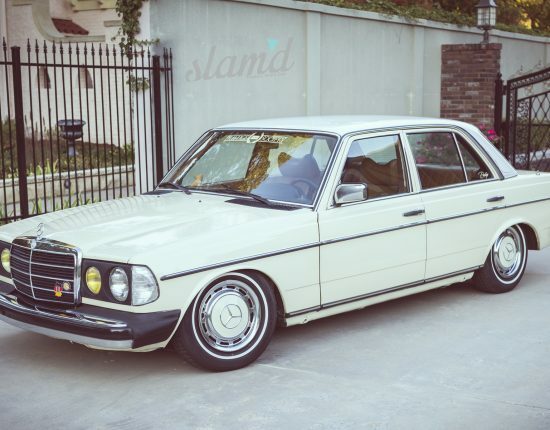 A one-off custom grille was added to accentuate the front attitude and both the front and rear factory bumpers were heavily modified for a cleaner look. 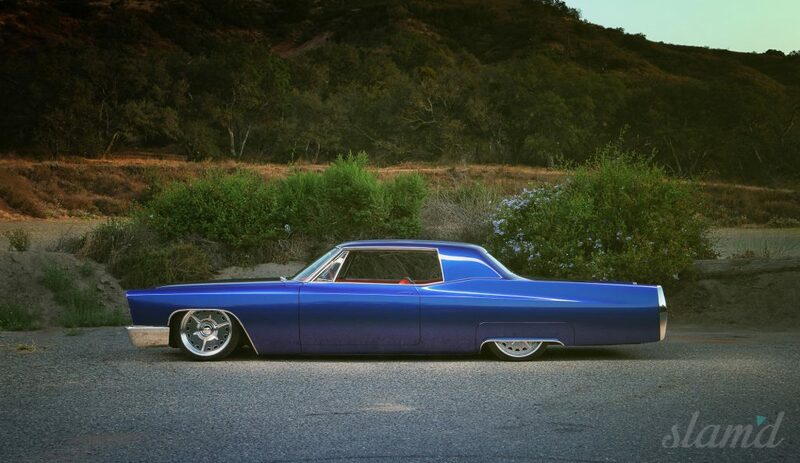 First, the front was filled in on the lower half to mimic the look of a ’65 Coupe DeVille. The rear was tucked 3/4s of an inch and filled with 3/16th flat stock to match the fronts. 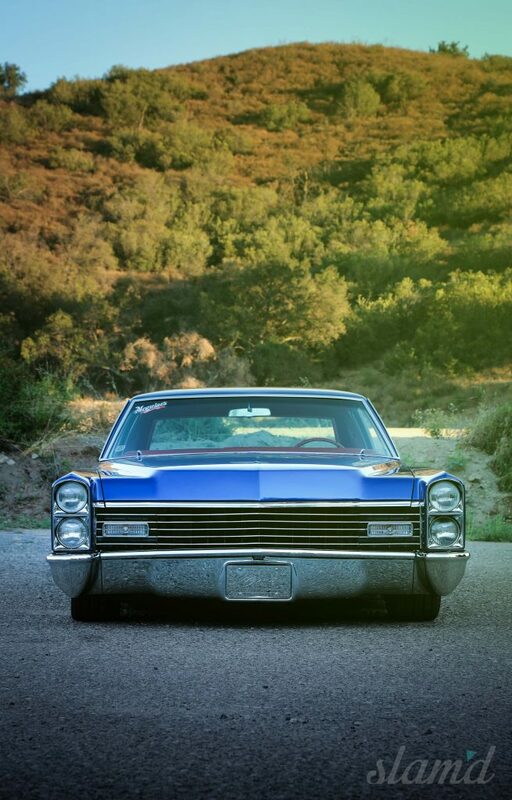 After the elaborate bodywork was completed and smoothed to a glass-like texture, the Caddy was ready for its signature paint. Finally, with the exterior boasting its broad, flat-surfaced finish and iconic stance, the interior was addressed to complete the project. 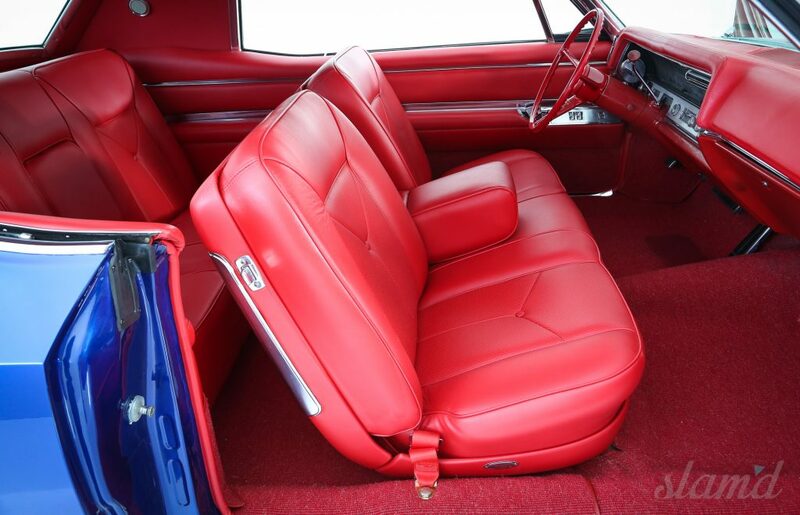 Tempie’s bold choice with an opposed interior color paid dividends. 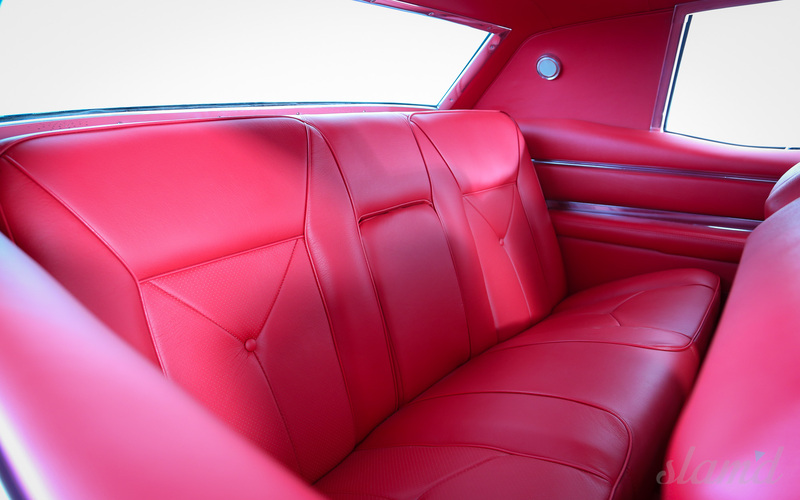 The cabin was wrapped in fine bright Red Italian leather. The dash sports the same elegant upholstery as does the headliner, door panels, and massive trunk. The carpet mimics the color perfectly. Working in seamless harmony are the classic gauges and trim pieces, detailed to their former glory. 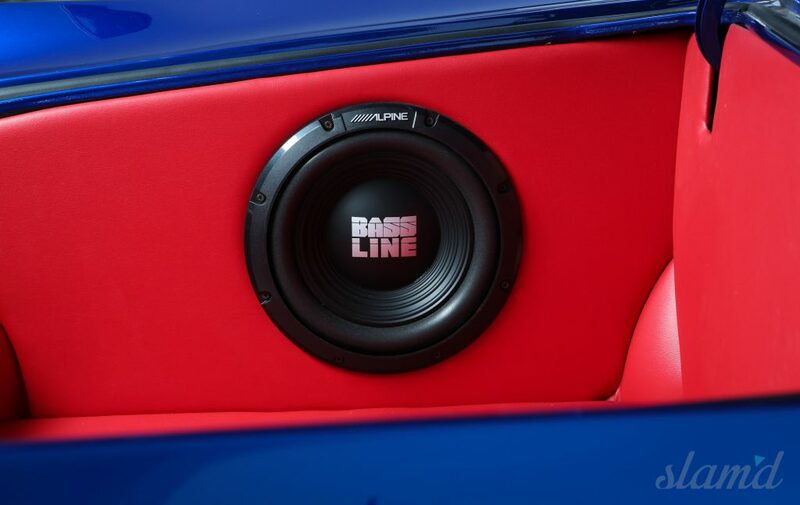 Final modern touches come by way of Alpine speakers cleverly hidden from view in the door panels. The factory original head unit sends its sound waves to the invisible speakers, an Alpine 5-channel amp, and a single Alpine Bass Line sub-woofer mounted visibly in the trunk. 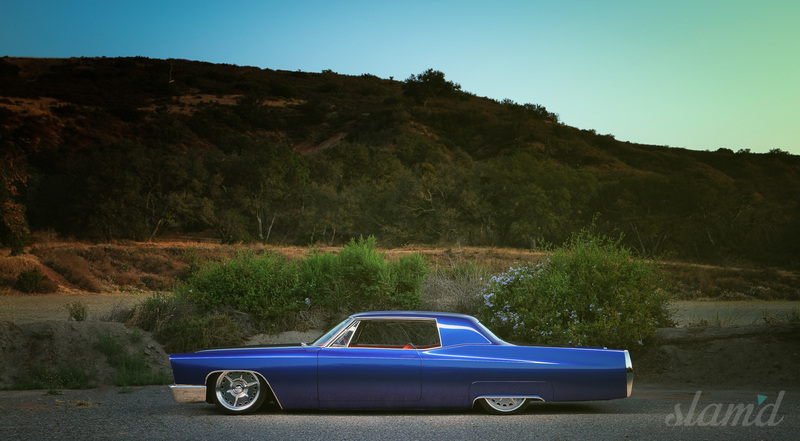 With a relatively simple goal, a SEMA-esque time crunch, and a platform that has been endlessly customized over the years, Rick and Tempie have achieved something truly special with their Sinister Coupe DeVille. 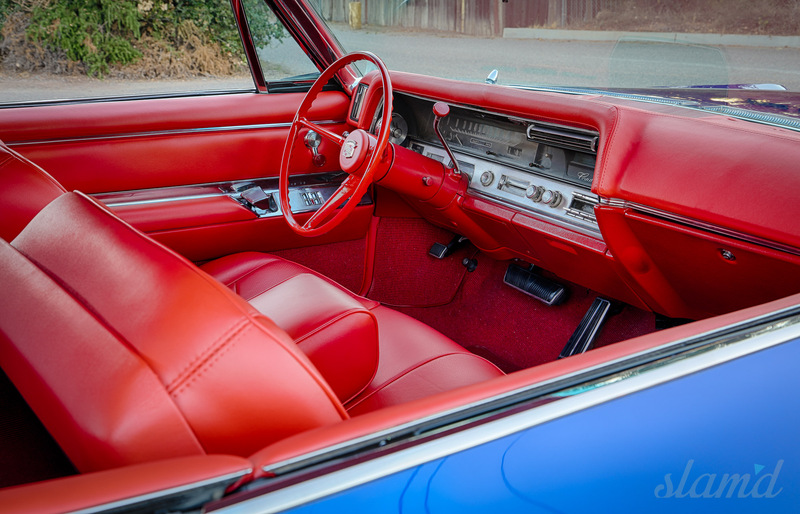 The trademark blue and chrome exterior works so perfectly with the saturated red interior, it serves as a physical illustration of the amazing teamwork of the Abates. Their synergy is perfectly represented in their latest triumph. #TeamSlamd can’t wait to see what they cook up next! 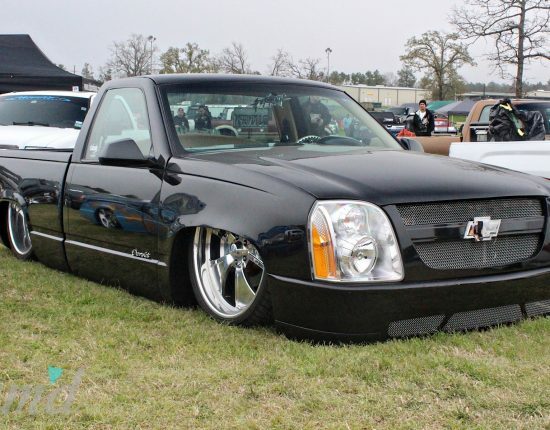 Lone Star Throwdown 2015 – LST Smashes Records!